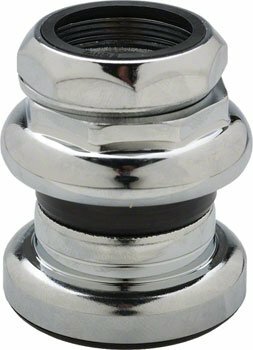 The Tange-Seiki Passage 1" threaded headset is constructed of steel and features 5/32" ball bearings. High-tension steel. Stack height 30.3mm. Triple sealed mechanism. Color: Silver. Weight: 156. Crown Race: 26. Bearing Type: Cup and Cone. Defined Color: Silver. S.H.I.S Upper: EC30. S.H.I.S Lower: EC30. S.H.I.S. Stem Clamp Diameter: 25.4-24tpi Quill. Lower Stack Height: 10.3. Upper Stack Height: 20.3. If you have any questions about this product by Tange-Seiki, contact us by completing and submitting the form below. If you are looking for a specif part number, please include it with your message. BikeHard Carbon Expander Compression Cap 1 1/8"